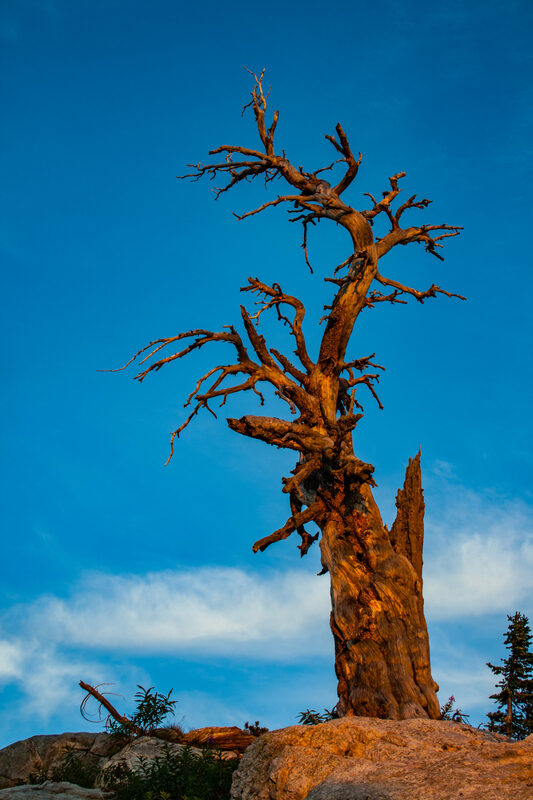 I found this gnarled tree in Caribou-Targhee National Forest, and I nearly shot the total solar eclipse on August 21st through its branches. The angles would have been perfect for a unique and dramatic shot, but I decided I had to have the Tetons in the image. The evening before the eclipse, there were major wildfires in Montana, and storm clouds were brewing on the horizon. We were growing nervous about our chances of witnessing the eclipse the next day. As the sun descended into the smoky haze hanging over the horizon, this tree was bathed in red light. I love the lines and drama that come built-in to this tree; it tells a tale of the fierce mountain winds it battled to stay upright. The younger tree off to the right seems to stand at attention in admiration, and gives hope for continued life on the mountain.